Ask anyone to name a famous Roman and the name of Julius Caesar is sure to be the most popular answer. In spite of the fact that he failed twice to conquer Britain, he still became an icon of Rome. So how did this man manage become a legend? Before a short account of his life, we need to look at the man himself. Only then can we see how he managed to become so revered. He was a tall man, with broad shoulders, dark eyes and blond hair. He is often portrayed as wearing a laurel wreath on his head, which he said was to emphasise his presence. In reality, it was to help hide his baldness. 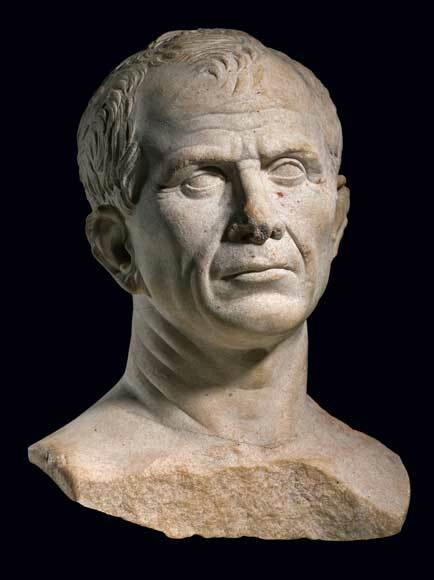 Above: a bust of Caesar said to have actually been done while he was alive (most were done after he died, it seems). 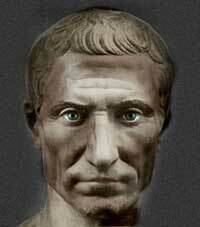 Julius Caesar had the personality and charisma that allowed him to win anyone over to his way of thinking. He was a true leader, in that he led from the front, often at the head of his army as they went into battle. Nothing seemed to deter him in his single mindedness and push for success. It is said he had a method of inspiring his troops to give their all in any situation. This he did, again by leading from the front -- for example, he would be the first to swim across a river ahead of his soldiers, and so instill their confidence in his leadership -- if he could do it, so could they. He was a keen horseman, was skilful with the sword and had a boundless energy and enthusiasm which motivated those around him. At parties and gatherings, he was the centre of attention. Airing his knowledge and showing a ready wit and humour that made him popular. He could charm the ladies, and leave the men in awe of his personality and intellect. Along with the laurel wreath, he was a snappy dresser. His purple senatorial tunic had full length sleeves added which had fringes at the cuffs. Something unknown of in Roman times. His personality was such that it enthused a complete will to win in his armies. As we shall see later, he took a massive amount of land for the empire, and himself. He knew he value of communication at all levels and would be seen wandering amongst the ranks and foot soldiers, asking their opinions and noting their gripes. It was this accessibility and personal contact that made him so popular with his men. Considering his enormous military skills, ensured a willing following. Gaius Julius Caesar was born in 100BC to a family that was not part of the upper levels of society. In the days before attitudes changed, only certain classes could have attained the a high level of authority. So on the surface, he was not emperor material. Caesar began his career with a variety of minor postings in the Roman administration, where he gradually endeared himself to those around him with his intellect, charm and communication skills. He had, what we know today as, charisma. This is the one attribute that can compensate for a lack of natural talent. Early in his career, Caesar saw an opportunity for social advancement in the form of a lady named Cinna. She was the daughter of the famous General Marius, a legend himself to the Romans. Caesar married her and in 76BC, Cinna gave birth a daughter, Julia. Marrying Cinna gave him status and would help is advancement in society and government. In 63BC, he achieved the status of Chief Priest after forming an alliance with an influential military commander, Pompey and Crassus, another man of power who had considerable wealth. This was helped by the marriage, at an incredibly early age, of his daughter Julia to Pompey. Caesar had planned to use this friendship as a means to entering the Senate of Rome, but in 60BC, he was shunned, even though he was now governor of Spain. 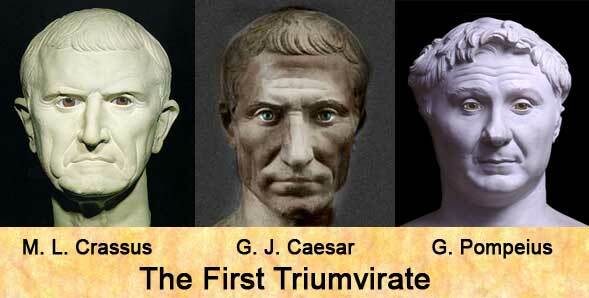 So he established the First Triumvirate, with Pompey and Crassus, thereby securing a path to further his aims. He had created a republic within the Roman Empire. In 59BC, he gained his first consulship and so became the ruthless dictator he had always dreamed of being. He regarded himself as all-powerful, even to the extent of ignoring instructions and vetoes from Rome. This did not stop him from advancing the cause of the empire, and in 58BC he began a campaign that took him across central and northern Gaul, gathering territory as he went. 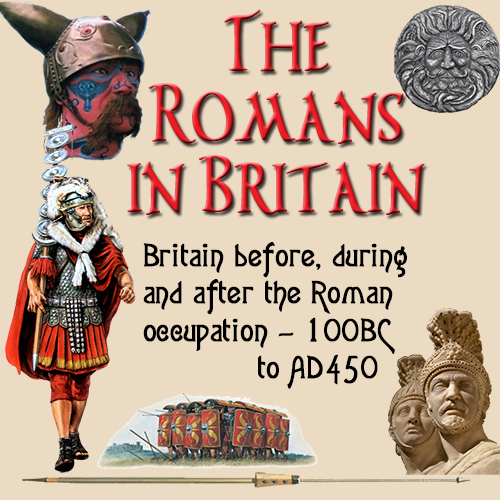 In 55 and 54BC, he made two attempts to cross the channel and take Britain, but these were such diasters, they are regarded today, not as attempted invasions, but mere expeditions. Then in 54BC, Julia died suddenly at the age of 22. This caused a strain in the relationship between Caesar and Pompey, which was made worse by the slaying of Crassus by the Parthians, who were sworn enemies of Rome. In 49BC, civil war broke out between the followers of Caesar and Pompey, which ended the Republic. Wherever Pompey fled, Caesar's armies followed him. Eventually Pompey fled to Egypt, where he was killed on the orders of King Ptolemy XIII. Caesar then went on into Egypt. He captured the half-sister of the Egyptian King and took her as his mistress and Queen. The Alexandrian War he fought against the Egyptians was a success for him, resulting in the taking of a great deal of land and the death of Ptolemy. From there he move to Asia Minor, taking the throne of King Pharnaces. It was here the immortal phrase 'I came. I saw. I conquered.' was attributed to Caesar. However, the pressures of power grew to great, even for a man with such vitality. He became irritable and erratic. It is said he was in conversation with a soldier, who was airing his grievances, when he suddenly ordered the soldier be executed, which was done. In later years, his image on coins and pottery showed a man aged well beyond his 51 years. He was haggard and drawn, showing the signs of strain. Here was a man driving himself to an early grave. In between all the war mongering, he undertook on a series of reforms, mostly unpopular, that would change to course of the empire. These were not well received and a gang of sixty conspirators formed to remove him from office. Perhaps, the final act that secured his fate was his appointment as perpetual dictator in February 44BC. 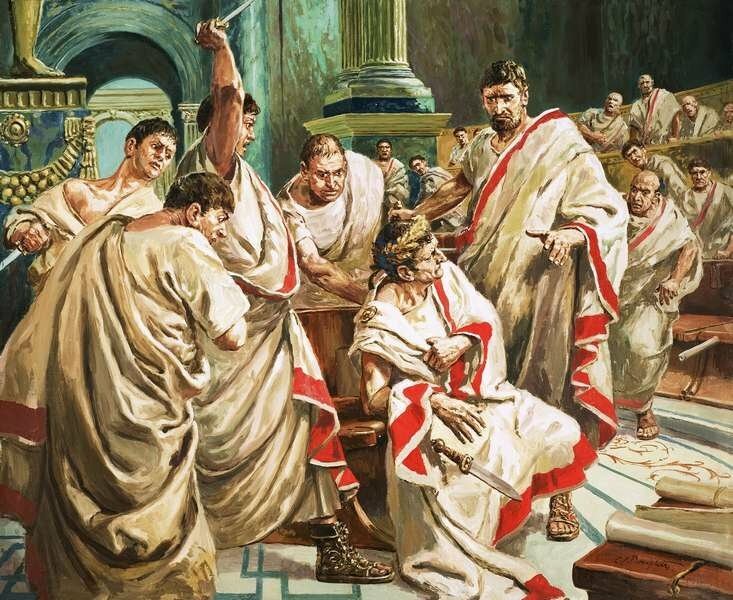 Although Caesar had managed to create such a powerful image to the people, the governing classes did not like the changes he brought to the empire. They wanted things back to the way they used to be. 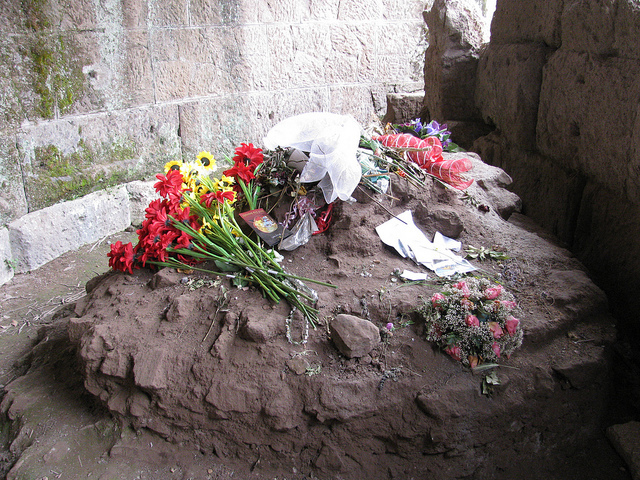 On 15th March the same year, he was infamously slain by his enemies in what had become known as 'The Ides of March'. in Rome where he was cremated. It is now visited by admirers who leave flowers and such.